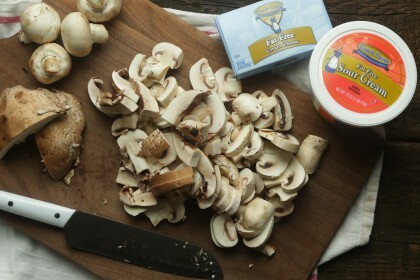 In a large saute pan on high heat add in the olive oil and saute the mushrooms, onions, and garlic until browned, about 8 to 10 minutes. Next, add in the chicken and saute until it is completely cooked through. Sprinkle on the flour and mix it in completely, followed by adding in the beef stock and bring to a boil. 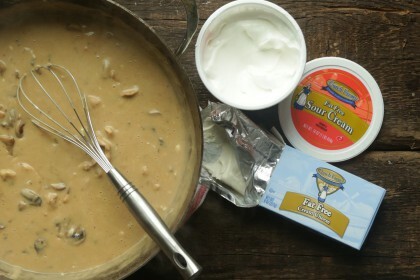 Once the sauce becomes very thick, whisk in the ½ cup of Low Fat Dutch Farms® cream cheese and ½ cup of Low Fat Dutch Farms® sour cream and season with salt and pepper, turn the heat to low. 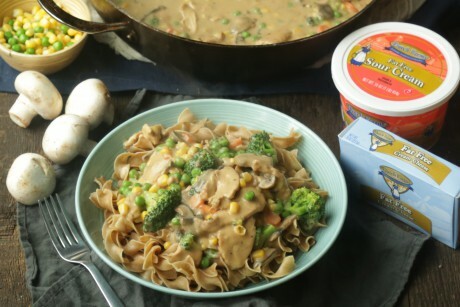 Once the vegetables are par-boiled fold them into the thickened creamy sauce. 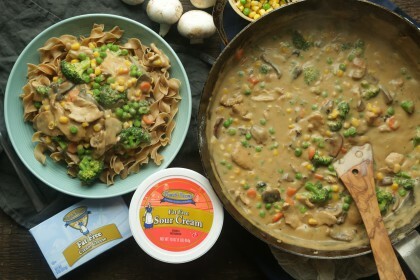 To serve, pour a small amount of the vegetable and chicken stroganoff over some cooked wheat noodles.